Home > Do you have a criminal history? You may be unpleasantly surprised. I have been a paralegal assisting criminal defense attorneys for over 20 years. During this time, I have worked on many expungements. 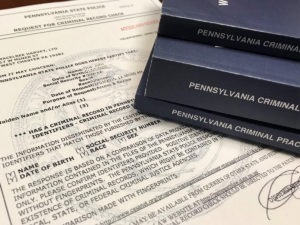 Many people believe that if they were charged with a summary (such as disorderly conduct) or a misdemeanor or felony offense and those charges were ultimately dismissed or withdrawn, that they were automatically removed from their records (namely their official criminal history as maintained by the Pennsylvania State Police and on Pennsylvania’s statewide court website). They later find out, when a criminal history is requested for employment or other purposes, that a record of the arrest shows up. Even though the charges were withdrawn or dismissed, their notation as non-conviction criminal history could impact the ability to obtain a job or even volunteer for children’s activities. Additionally, as referenced previously, in Pennsylvania, all criminal and summary cases are posted online and are accessible to the public. The only way to have this non-conviction information removed is by Court Order. This process is called expungement. What is an expungement? Expungement is a court process which, if granted by the Court, leads to an Order being entered to destroy and/or remove a record of an arrest (or, in certain cases a conviction) from public view and restricts access to law-enforcement agencies and criminal courts as set forth in Pennsylvania’s expungement statute, 18 Pa.C.S.A. §9122. An arrest resulting in charges that were dismissed, withdrawn, not prosecuted (“nolle prossed”) or a not guilty finding are eligible for expungement in most cases. The individual has been dead for three (3) years. The individual received a citation for Underage Drinking on or after turning 18 years of age and all terms and conditions of the conviction were satisfied, including the license suspension, then expungement is available on or after their 21st birthday. In 2016, the Pennsylvania law was expanded by “sealing” the records of certain second or third-degree misdemeanor convictions from public access. Such records remain available to specific entities such as law enforcement and state licensing agencies. 18 Pa.C.S.A. §9122.1. An “Order for limited access” can be requested if the individual has been free of arrest or prosecution for a period of ten (10) years following conviction or final release from confinement or supervision, whichever is later, and has completed all punishment, including payment of all fines and costs in the case. As of December 26, 2018, the law regarding Orders for limited access was expanded to include all qualifying misdemeanor or ungraded offenses carrying a maximum penalty of no more than five years (an expansion of the prior version of this law, which was limited to offenses carrying a two-year maximum penalty) if the conditions in the prior paragraph are met. Notice of expungement or limited access to records is submitted to the Pennsylvania State Police Central Repository and all criminal justice agencies that have received criminal history record information. Public records, however, are not included. This would include, but not be limited to, internet articles, police blotters, press releases, and newspapers. Nor are non-government entities which have captured and retained this information while it was publicly accessible. In my capacity as a paralegal, in addition to helping draft the Expungement Petition and proposed Order, I track the law enforcement agencies’ compliance with the Expungement Order to ensure that expungement has been completed. Our Criminal Defense team has handled diverse criminal matters involving felony and/or misdemeanor offenses in Chester County and surrounding counties as well as the Federal Courts. With well over fifty years of combined experience, our criminal defense attorneys are uniquely qualified and well prepared to assist you. To have your case reviewed for expungement or limited access eligibility, contact MacElree Harvey at (610) 436-0100. An order for expungement is prohibited where the defendant was placed on ARD for certain sexual offenses where the victim is under 18 years of age. 18 Pa.C.S.A. §9122(b.1). « Does the elimination of the alimony deduction affect my Pennsylvania support payments?